I’m not a great fan of tv’s portrayal of faith folk, for below the surface there often lies a hidden agenda where anyone with a religious or spiritual belief is fair game for overkill satire and ridicule. However, one recent series on the UK’s BBC has changed the whole scapegoating game. 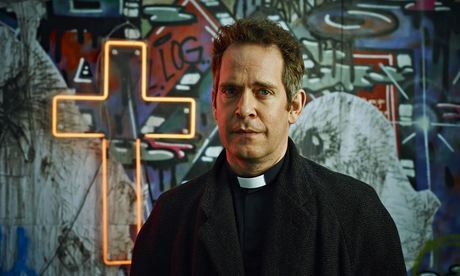 ‘Rev’, starring Tom Hollander as a kind but deeply flawed Anglican vicar trying to hold together a failing inner city church and tenuous marriage has ticked all my boxes. It reveals the ludicrous position that many men and women have been placed in as they attempt to work out a sense of Divine calling on a full-time basis within organised religion. Tom’s character, Adam, isn’t some kind of evangelical superstar, confident in his packaged message and his own pastoral abilities but rather a very human being attempting to be honest with both God and man. Anyway it’s now come to an end but, like the wine at Cana, the best was left until the end. Not wanting to completely spoil the plot for any of you who might get to watch the reruns, Adam ends up broken and despairing on a city park, green hill with his whole world crumbling around him. In his own psycho-spiritual abyss he starts to dance and sing the following lines from Sydney Carter’s whimsical, little hymn from the 1960s. As Adam tentatively danced something broke within my own spirit – here in the often plastic schedules of tv land, Spirit was speaking loud and clear to me and all who watched. The overwhelming sense of Other continued as Adam suddenly notices that a tall homeless person, with cheap, green, track suit bottoms, wooly hat and accompanying beer can, has suddenly appeared from nowhere to join in his melancholic song of hope. The stranger, in the form of my fellow countryman, actor Liam Neeson, sits down to chat, calling Adam by name and staring at him with compassionately green, glint-filled eyes. ‘I understand Adam’, poignantly flows from the actors lips as both Adam and I simultaneously feel a deep strength flow into our dark inner worlds. Interestingly, ‘Rev’ was written by a team advised by a number of past or present clergymen, hence its authenticity, albeit one dressed up at times dark, comic humour. Sadly Adam is not alone in being pulled in two conflicting directions. The tug for a normal family life, one away from the continuous demands of others and a genuine sense of calling to be a channel of Divine Love is the day-to-day experience of many professional clergy. Yet no matter how much our psyche-soul’s secrets are repressed by routine, ritual and devotion, the real us will always win in the end. Let’s face it, betrayal and its resulting disillusionment are the norms of many religious and spiritual pilgrims. Yet, in the depths of nervous breakdowns and the like, the Truth gets a chance to shine through our ego’s protective religious veneer. Here, at the end of our inner rope, we unexpectedly find a Presence; One who has been waiting patiently for us to turn off our frantic search for meaning, whether secular or religious. Falling off our inner treadmill, in a heap of dark despair, doubting our very sanity, a Light appears to lead us into a new wholeness. The game is up for our exhausted ego, as the devil load of communal expectation and religious striving falls away, perhaps for the first time in our earthly Sojourn. How strange that many of us only get in touch with the Dance of Divine Love after darkness has done its worst. Yet, even such darkness ultimately proves to be a servant of the Light, that Divine Energy and Purpose that skips its way across the portals of our Being. A Light that invites us to join in the jig of joyous liberty, even on the darkest of demonic dance floors. The secret of our release is closer than we all imagine – unless we become like little children we will not see or experience the Kingdom/Queendom of God. Dance on all you Adams. You definitely hit a home run with me with this one, Dylan. I know the story and the feelings very, very well. Blessings on you, my friend. Wonderful George. Yes, knowing just a little of your early history, I’m catching a wee glimpse of why it might have touched you deeply. Thanks, Dylan. The last two episodes of Rev were an incredibly moving and compassionate depiction of the Easter story. I love your writing too. Hi Irene. Yes, I’d have to agree. They conveyed more truth that a squillion sermons! It’s when it all hangs out that it begins to get real. Thanks for a thought provoking reflection – I need to catch up on Rev (as I am one!). I love ‘the jig of joyous liberty, even on the darkest of demonic dance floors’, because that’s how it is so often. Not original to me, but here’s a nice one to avoid the ‘Kingdom/Queendom’ thing – the Kindom of God. I like it on a number of levels, it’s about community and implies the fullness of all that both genders bring in Christ in an interconnected way, it’s non-hierarchical and it’s much more relevant in today’s world where kings and queens are either a shadow of the past (like the UK) or are gone. Thanks for dropping by Kenneth. Yes, I like the Kindom of God thing! The original languages of course uses feminine nouns to describe the real of Divine Love, which is far too way out for some Christians who believe that the translators are always right. I see the Queendom as the sphere of influence by Wisdom, the woman calling in the streets in Proverbs.of course Sppirit is also a feminine noun except in Latin, so again Queendom is that which is inspired or realigned by the Breath of God. Every blessing with your joyous jigging! Thanks Dylan. Yes, sometimes emphasising the distinctiveness of male and female aspects of God and his presence in the world is really important. The large number of feminine nouns in sacred writing are usually airbrushed! We need both female and male, reflecting all the ragged, wild and messy beauty of all that it is to be human and in the image of God. The ‘Word Made Flesh’ can be nothing less than all of this and more. And I’ll keep jigging. PS I am very interested in your journey. I too have been through a few ‘morphs’ including different parts of the ‘charismatic’ world and now – with a touch of humour and I hope a light touch – find myself as an Anglican priest reflecting openly on all kinds of things that once were ‘taboo’. I thank God for the journey! I’ve not yet seen the last two episodes of the latest series of Rev, but this describes the feelings that I find in every episode. Thanks for the reblog FHC. This is beautiful – your description of how the Spirit of Love meets us right at our darkest place is just how it was in my experience…thank you for sharing this! His light overcomes the darkness..I love how you said even the dark becomes a servant of the light…all along He knew it would work out in just that wonderful way..that is a comfort to me! How does one go about watching “Rev” in the US? It’s available on iTunes – all three series! The second last episode in Series 3 was the one that I refer to in this wee Blog Post!